Every house has its own mealtime routines for the four-leggers and two-leggers alike. Finding the routine that works best for your dog and family is important; this includes the diet you feed, when you feed it, and how you feed it. As long as you and your dog are happy and healthy with your choices you can’t go wrong. There are new foods coming out every day designed just for dogs as we continue to research the benefits and damage of different diets. With ever increasing options there are a couple of main categories including pre-packaged dry and wet foods, raw diets homemade and prepackaged, and home cooked meals. The choices within each category are vast and there are good and bad options in each; the FDA provides minimal regulations on dog and other pet foods, so when it comes to your four legged child it is your responsibility to thoroughly research his diet. Thankfully pet foods are required to be labeled clearly with all the ingredients listed, and you can easily compare different foods online. To make sure you are making the right choice for your dog consult your veterinarian or find a pet nutritionist. Another important factor in mealtime is when to feed your dog; which is often determined by the human schedule of the household. It will benefit your dog to create a feeding routine that can be easily maintained, this may include free-feeding or set meal times. Free -feeding can be a good option for slow eaters or families with hectic schedules, but it can have some drawbacks including decreased appetite and weight loss (this can also be a recipe for creating a picky eater). Having specific meal times will often avoid some of the problems associated with free feeding, it also helps to consistently pick up the food after a certain period of time such as 20 minutes; this is how we feed the daycare and boarding dogs in our care so they understand they only have a certain time frame that food is available. Instead, you may choose to feed your dog in a less formal way; my dog Bruiser doesn’t have set meals, rather he eats via training and interactive toys throughout the day at various times. In order to do this, I measure out his daily ration into a bag each morning and I simply give food as needed through training sessions, interactive food toys, food searches and other activities. Occasionally this feeding method results in some leftover food or if we have been very active I may need to measure out some extra food; this feeding method is ideal for feeding for your individual dog’s activity level and discourages weight gain. How you feed your dog is the fun part. You can feed in a regular food bowl which helps to save time and allows for easy clean up, you can use a slow-feed or puzzle type bowl, or you can have a variety of interactive feeders. 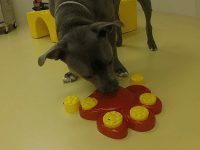 Feeding your dog through interactive toys can help to train them to entertain themselves; these are a great option to use when your dog is alone during the day. These objects also help to mentally stimulate your dog, and through working for his meal, will result in a calmer happier pup. Bruiser thrives mentally and physically on his varied feeding schedule using a variety of interactive toys; I discovered the best mealtime habits for him after some trial and error and now we are both satisfied. Find the mealtimes and methods that fit you and your dog’s needs and you will be on your way towards happy and healthy. Previous: Previous post: Is Dog Boarding Right for Your Dog?